British artist Isaac Julien explored dance, architecture and African cinema in Fantôme Afrique, a film produced for three screens, creating a rich environment of sounds and images. The Lab was one of three institutions to co-commission Fantôme Afrique with the Pompidou Center in Paris and the Ellipse Foundation in Lisbon, Portugal and the Lab is proud to be its US premiere. Emerging in the 1980s among Britain's new wave of black independent filmmakers, Julien's feature film, Young Soul Rebels, won the Critic's Prize at the Cannes Film Festival in 1991. 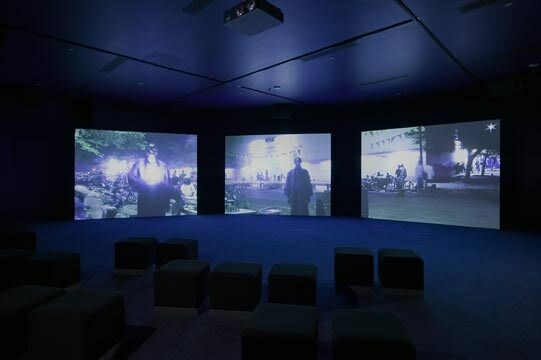 In the mid-1990s, focusing on issues of power, race, and desire, Julien continued his experimentation in film using large, multi-screen installations set in museum galleries. Fantome Afrique was inspired by French author André Gide's 1925 expedition to Africa with his filmmaker companion Marc Allegret. The film explores the creative potential that emerge at the point of interaction between local and global culture.